After a strong January fueled by horror films, the box office goes with what it knows and this time throws out some zombies. But this time, they've got heart! Warm Bodies tells the story of R (Nicholas Hoult, X-Men: First Class), a not-so-mindless zombie who wanders about with just his thoughts (conveyed via extensive voiceover) until he meets the human Julie (Teresa Palmer). Instantly smitten, R decides not to bite her and instead protects her from the other zombies, and finds himself beginning to regain his humanity, to the joy of Julie and to the dismay of Julie's dad (John Malkovich), the leader of the human survivors. They soon find themselves caught in the middle of a human/zombie/other, more evil zombie war. It's the first zombie love story since Shawn of the Dead. This is considerably higher concept than what last month's big openers Texas Chainsaw 3D and Mama brought to the table and it's not really a horror movie in the vein of those; it's more of an oddball teen romantic comedy attempting to counterprogram the Super Bowl. 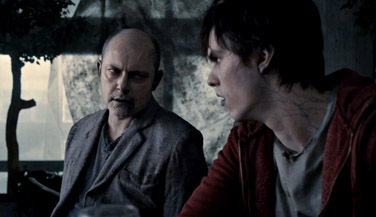 Warm Bodies is an adaptation of a well-received 2011 novel and is directed by Jonathan Levine (50/50). It's getting above average if not stellar reviews, and there's certainly a clever bit or two in the advertising. The idea of a self-aware zombie works for me, but your mileage may vary. If you haven't noticed, zombies are a thing (see: The Walking Dead's popularity) and are going to continue to be a thing this year (see: a World War Z commercial during the Super Bowl) so you should just get used to it now. Hey, it's better than sparkly vampires. Opening in just over 3,000 theaters, Warm Bodies will win this weekend with a total of about $19 million. Look, just because The Expendables and The Expendables 2 made a lot of money doesn't mean all you old action stars are going to have careers again, okay? Ahnold bombed a couple of weeks ago with The Last Stand and now Sylvester Stallone is back with Bullet to the Head.